From classic to contemporary, this book features patterns for 9 different chess set designs that can be made on the scroll saw. Includes complete how-to instructions with information on compound cutting, patterns and instructions for playing boards and information on wood, safety, finishing and more. 66 pages.Note: Due to their nature, books are non-returnable. Defective books will be replaced. 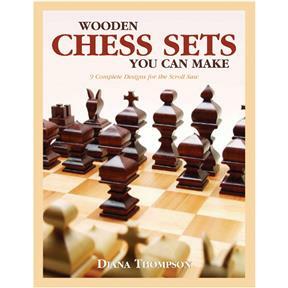 From classic to contemporary, this book features patterns for 9 different chess set designs that can be made on the scroll saw. Includes complete how-to instructions with information on compound cutting, patterns and instructions for playing boards and information on wood, safety, finishing and more. 66 pages.